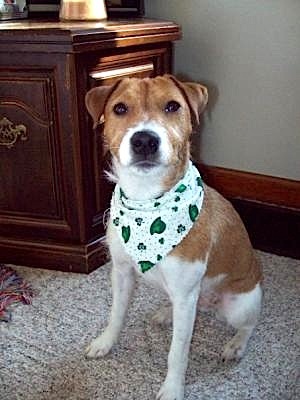 This is our JRT mix Gappie, who we adopted January 2008 from a rescue group. She is the best thing about our day, everyday! We are having so much fun teaching her to behave and sit, stay and roll over!! She is a very smart and wonderful dog. She loves to go for walks and is learning to walk nicely by our sides! She also loves to go rollerblading with us! She can sprint along next to us for miles - and has much more energy than her parents!! She does not like her crate, but stays in it like a good girl during the day while we are working. She is a lot of work, but I can't imagine life without her! We love our Gappie!! Comments for Gappie's Full of Energy! I just wanted to respond to the initial statement posted by my lovely fiance... Gappie which is short for Gap Wedge (golf term...look it up). She loves to jump at windows due to passing birds or people or squirrels, pretty much anything that is in eye sight. If she were to ever get free from the house or leash she would run and run and run forever. But I was able to teach her to roll over in about 5 minutes, and I have to say she is the smartest dog I have ever trained.